15.6-Inch LED digital photo frame high resolution of 1280*800 display. It can be used as a MP3/MP4/E-book/calendar or a clock. With 2 different size USB connection for reading the U Flash Disk and connecting to computer. Take a SD card from a camera and play photos from it directly without any additional processing. Tabletop and wall mountable frame with a stand for support use. A compact IR remote control (battery not included) for convenient access to playback controls. 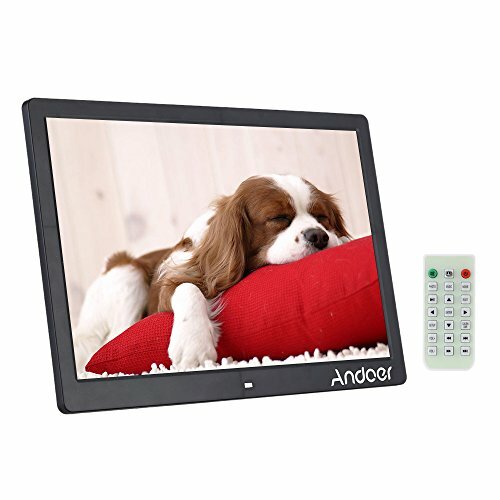 Features: 15.6-Inch LED digital photo frame high resolution of 1280*800 display. Play videos and music with built-in speakers and headphone output jack.